Emory Law has named Michael S. Kang the second recipient of the David J. Bederman Research Professorship. The professorship recognizes the outstanding contributions of a faculty member and offers a research leave. 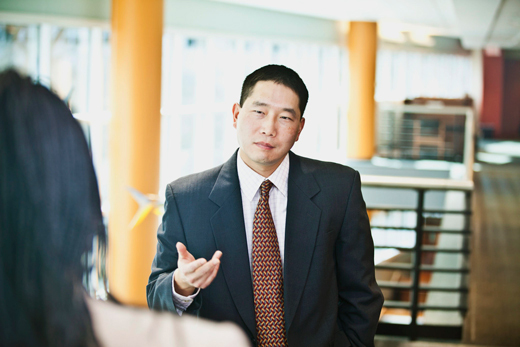 Kang's research focuses on issues of election law, voting and race, shareholder voting, and other questions at the intersection of law and politics. His work has been published by the Yale Law Journal, NYU Law Review and Michigan Law Review, among other leading journals. He also serves as co-editor of the book series Cambridge Studies in Election Law and Democracy and co-authored a chapter for the first book in the series, "Race, Reform and Regulation of the Electoral Process." Kang plans to use the time afforded by the professorship to study judicial elections and campaign finance law. Kang received his BA and JD from the University of Chicago, where he served as technical editor of the University of Chicago Law Review and graduated Order of the Coif. He received an MA from the University of Illinois and his PhD in government from Harvard University. After law school, Kang clerked for Judge Michael S. Kanne of the US Court of Appeals for the Seventh Circuit and worked in private practice at Ropes & Gray in Boston before joining the Emory Law faculty in 2004. He has also served as a visiting professor at Cornell and Harvard law schools. “I am truly honored to hold this research chair dedicated to my late colleague and friend, David Bederman. I look forward to using the chair to continue my work on law and politics,” he says. The professorship is named in honor of the late K.H. Gyr Professor of Private International Law, David J. Bederman. The David J. Bederman Fund also supports an annual lecture and fellowships for study at the Hague Academy of International Law. Bederman, who died in 2011 at the age of 50, was both a world-class scholar of international law and a beloved professor, who taught an estimated 4,000 students during his 20 years at Emory Law. Beyond his gifts as a prolific writer and teacher, he also excelled in practice, enjoying the uncommon experience of arguing before the U.S. Supreme Court four times.